Today, October 25, within the Labour Institute, the National Trade Union Confederation of Moldova (CNSM) launched the “Trade Union Negotiator School” training project, attended by 31 leaders of trade union organizations, trade union committees and social dialogue committees “employer-employees”, trade union activists, leaders of 13 national-branch trade unions centres, CNSM leaders. 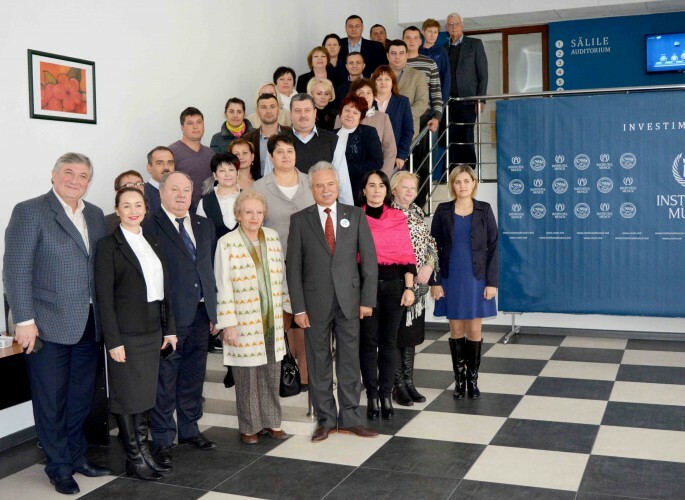 “The training project “Trade Union Negotiator School” is an integral part of the National Campaign” The collective labour agreement – the guarantee of your rights “, launched by CNSM at the beginning of this year,” said Sergiu Sainciuc, CNSM vice-president, at the beginning of the event. He pointed out that the “Trade Union Negotiator School” is an educational project aimed at the professional training of a team of modern trade union negotiators by developing the necessary competencies for conducting negotiation and mediation activities. With reference to the project itself, we mention that the training of the participants will take place during 3 sessions involving the CNSM trainers. The interactive program will be geared towards developing the theoretical and practical knowledge of the wide-ranging negotiation process in the field of labour law and trade union rights, participants will demonstrate skills for mediation and dispute resolution, as well as other negotiation practices. The result of the project will be the realization of individual projects by the participants on the collective labour agreements at the level of the primary trade union organization within the national-branch trade unions centre from which they were delegated. In this respect, it will contribute to the development of the social dialogue at the level of economic unity, the consolidation of the negotiation power of the trade unions and, finally, a positive impact in favour of social and economic protection of the employees and for the sustainable development of our society.